2 de abril de 2019. A group of students of second year of basic vocational training on electro-technical and mechanical installations at Luis Vives Vocational Training School are going to introduce their school, speak about drugs, and interview their English language assistant Cole. 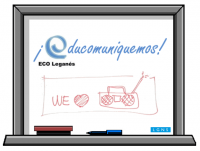 This is Radio Luis Vives in collaboration with ECO Leganés. A group of students of second year of basic vocational training on electro-technical and mechanical installations at Luis Vives Vocational Training School are going to introduce their school, speak about drugs, and interview their English language assistant Cole.